Celebrating 22 years as a full time dealer in the business!! 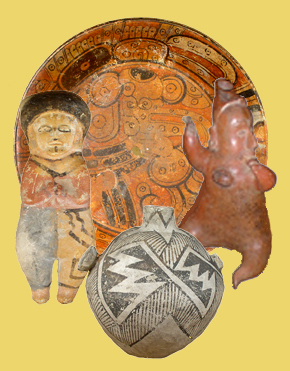 Pre-Columbian Art and Pre-Historic Native American Indian Artifacts comprise the majority of what you will discover here at Amiguet's Authentic Ancient Art! Choose from the categories below for immediate links to pages containing the current inventory with full descriptions and quality images of each item. Click on the image links for a larger photo of each object and please call or email regarding any questions! All items are guaranteed to be authentic and accurately represented. See our authenticity guarantee for more information. Thank you for the visit and please bookmark this home page if you are a collector!!! Inventory is constantly changing and if you don't find something this visit, it may be here on your next or we may have something already in inventory, but not yet advertised!! !